Need an extra charger for your Android smartphone or accessory and want to help save the world in the process? Consider Bracketron’s new Mushroom GreenZero chargers and the peace of mind that comes with “doing your part”. We’ve spent some time playing with these around the office and think they’re a pretty nifty package at a decent price. This guy weighs less than a pound and folds/wraps up to the size of a racquetball and comes in a green and white design. 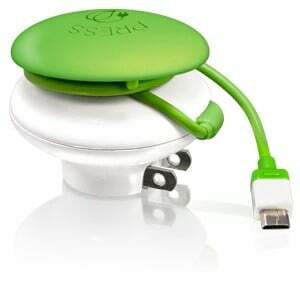 Looking very “Android”, the Mushroom Charger is much like a standard charger and has a wall outlet plug and microUSB. Where it’s better than the stock stuff is that it can be wrapped up and snapped away to pack in a backpack, purse, or bag. Forget losing the cord, the wall plug, or both – it’s an all-in-one package. AS to why this guy is so eco-friendly, it’s simple: Once your device is fully charged or unplugged, the charger automatically shuts off to save energy. There’s no worry of trickling out nickels and pennies of electric for no apparent reason. When you are ready to take the charger with you, simply roll the cord up around the charger and use one of the rubber chads to hold it into place. 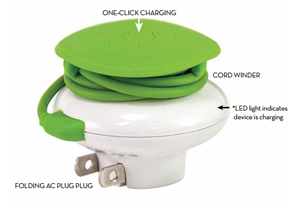 The wall plug snaps in and creates a flush bottom so there’s no accidental poking or tearing of items in your bag. 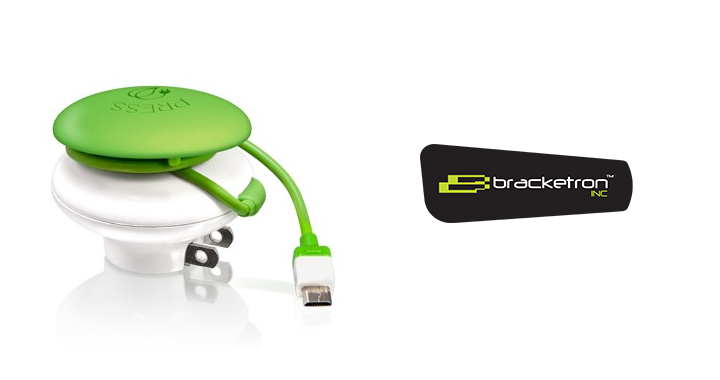 Although we only tested the microUSB design, Bracketron offers two other models – a 30 pin Apple connector, and a USB plug for nearly everything else. If you’ve got a handful of Android devices in the house, we say go with the microUSB, but the USB model does open the door to other items such as Nintendo DS, digital camera, etc. You can pick one of these up directly from the manufacturer for about $29.95 if you’re so inclined. There are also a number of retail partners who offer Bracketron products, some of which include Best Buy, Amazon, Staples, and Target.